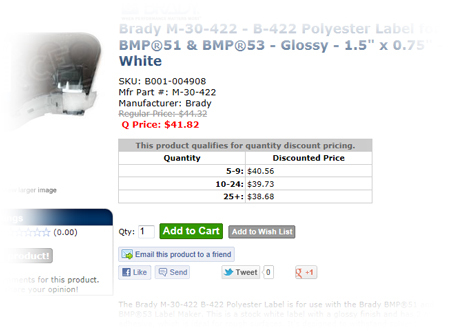 QSource.com features excellent prices for our wide selection of Brady items. Now we're helping you to save even more by offering quantity discounts on almost 800 Brady products including their most popular label cartridges and ribbons. Quantity discounts will start with as few as five items. If the Brady product you are interested in purchasing is eligible for a quantity discount you'll see the notice, "This product qualifies for quantity discount pricing" just below the regular pricing info. There also will be a chart with the quantities and discount pricing (see the screenshot). Q Source has been proud to be a Brady distributor since 1984. Our Web site offers more than 1,500 Brady items (including their latest portable printers) and if it isn't on our site our expert staff can get it for you quickly. Visit the QSource.com Brady Department to make your purchase. You can also make a purchase, or get more information, by contacting us via phone (800-966-6020) or email.